Can you believe that a young group of high school and college students are known to host the BEST Asian Lunar New Year’s (Tết) Festival in San Diego?! This is our 10th anniversary, so expect it to be HUGE for San Diego! Our festival has proven to be one of the largest three-day cultural festivals in San Diego, attracting more than 25,000 people every year! 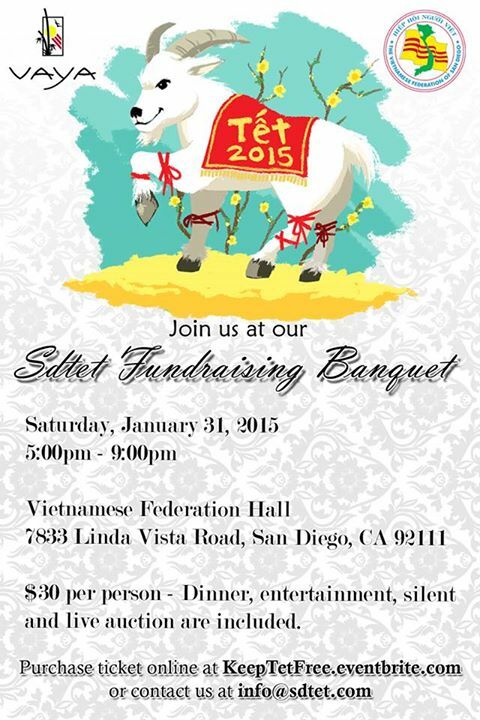 This upcoming year, the 2015 San Diego Tết Festival falls on the weekend of Feb. 20-22 at Mira Mesa Community Park. Best of all, it’s free to attend. Buffet-Style Dinner: Spinach Butter Salmon, Coconut Shrimp, Teriyaki Chicken, Traditional Vietnamese Springrolls, Solmen Salad, Green Salad, Chocolate dessert dipping fountain… etc. Silient AND Live Auction: Variety of Services as well as Rare/Unique/Limited Items that you can not get anywhere else! There will be at least 10 services and 10 items to auction! That’s just some of things we have planned for the banquet. The rest is kept secret as a surprise for you. Remember that the San Diego Tết Festival is hosted by a group of young students who not only have school, part-time jobs, but also are overexerting themselves to give the city an amazing fun-filled festival. So please come out and support the cause! Help Keep Tết Free for San Diego!